Give jewellery that’s one of a kind: choose a precious accessory with an engraving! For a special occasion or as a reminder of an important moment, inscribe it onto jewellery. For men and women, you’ll find many options which can be customised with a handmade engraving: from Composable Links with or without pendants to women's bracelets, from necklaces for him to key chains. Because a memory becomes truly unforgettable if you inscribe it onto metal.Jewellery which can be personalised with inscriptions are made of the finest materials: from the stainless steel of the bracelets, key chains and necklaces, to the yellow gold, rose gold and sterling silver plaques decorating the Composable Links which you can add to the iconic stainless steel bracelet. Jewellery containing personalised engravings are perfect if you’re looking for a romantic gift for your significant other, but also if you want to surprise a loved one on an important occasion. Discover all our great options, write the message you want to send to the people you love and create jewellery just the way you want. 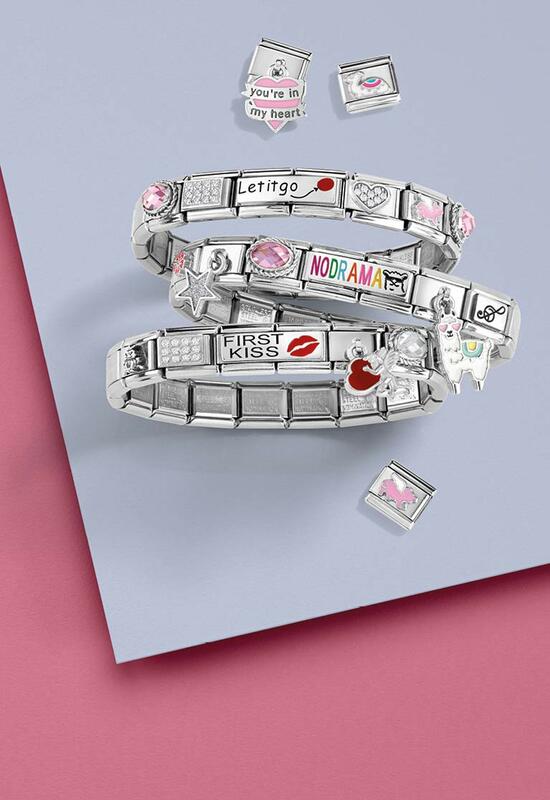 Create the Composable bracelet for the person you love and make it truly unique with a personalised engraving. 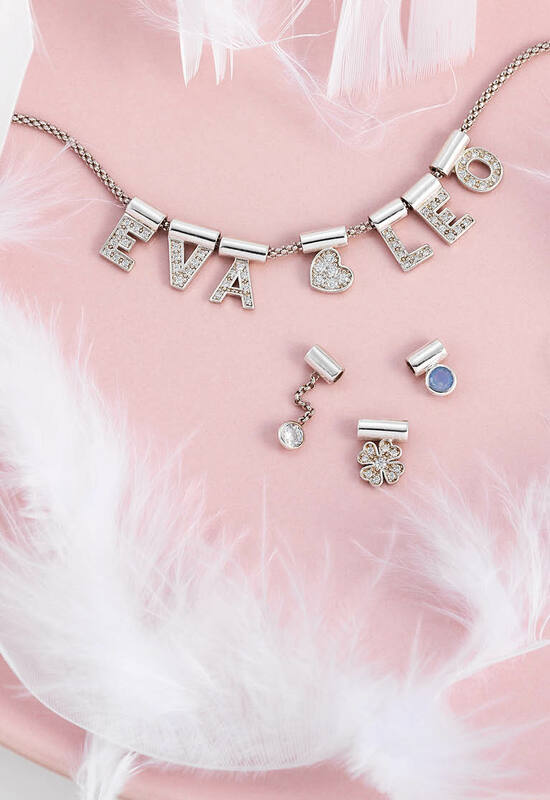 Next to the Links embellished with symbols, letters and coloured gemstones, you can add charms containing plaques which you can inscribe with your own personal message. Choose between Classic or Double Links: you’ll find those in sterling silver and yellow and rose gold ready to be engraved by our goldsmiths. 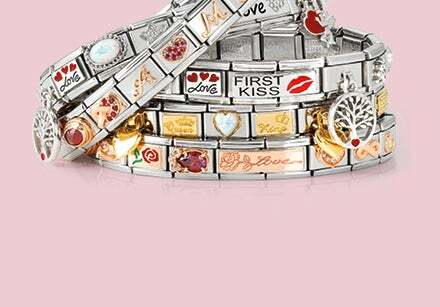 In addition to these, you’ll also find Links decorated with a precious engravable pendant, like the round pendant in silver or rose gold, or the heart-shaped version in rose gold, all of which you can dedicate to your woman on a very romantic occasion. 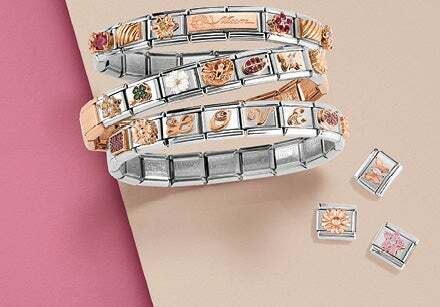 Another precious jewel for women you can customise with an inscription is the stretch bracelet from the Extension Messages Collection. This stainless steel bracelet is decorated with a gold plaque you can have engraved with your special message to an important woman. But there’s more: each of the stretch bracelets that’s personalisable with an inscription always contains a precious symbol to be chosen based on the occasion. The heart and the infinity symbol are definitely the most romantic. Then there’s the little angel, the perfect bracelet to give as a confirmation or First Communion gift, and finally the four-leaf clover, to dedicate to a friend, a sister, or your mother. There’s tons of jewellery you can customize with an engraving dedicated just for him! Starting with the key chain, a useful accessory you always carry with you, down to the pendant necklace. Each of these jewels, made of stainless steel and decorated with enamel and gemstone detailing, can be personalised with an inscription on the back. It’s a message that lasts forever and is something he’ll keep with him every day. Or choose one of the Trendsetter bracelets for men: exquisite jewellery in stainless steel, also engravable on the back, for a very special gift to a guy you care about. You can also choose Composable Links to add to his customised bracelet: the Classic or Double Links in sterling silver and gold are perfect for him too.